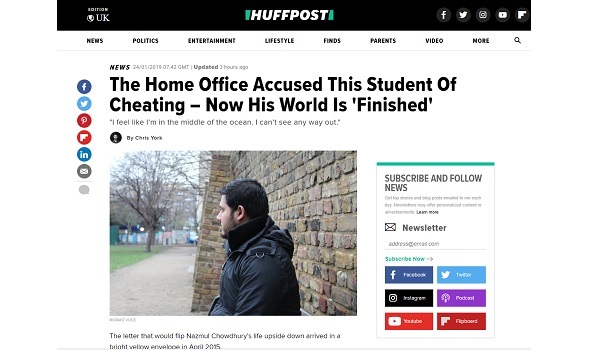 On 24 January, the same day we and the students held a demo and event at Parliament calling for justice, the Huffington Post published an in-depth story about the wrongful Home Office allegations against thousands of international students. In the article, Chris York dissects the flawed evidence, the Home Office refusal to acknowledge wrongdoing and the "hostile environment" and drive to lower migration numbers that contributed to this debacle. The article also quotes from a blog by Nazmul Chowdhury, one of the students affected.